Star Wars: The Old Republic is going to become mostly Free to Play this Autumn, following a year of subscriber numbers that clearly weren’t quite what EA was hoping for. We knew that we’d be allowed to level up to 50 without paying anything, but the details of exactly what we get without paying, and what we don’t, has been properly explained on the game’s website. 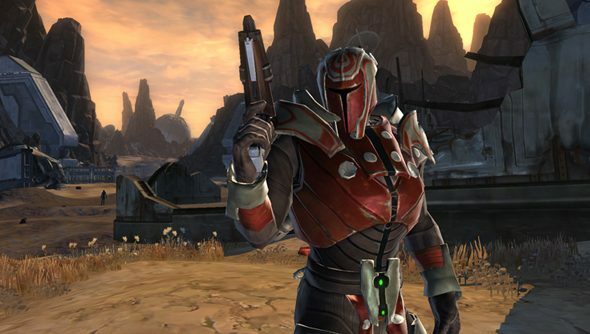 The big news is that all of the story content, which is SWTOR’s big draw, is going to be free to play. It’s tempting to question whether it was wise to give away the game’s biggest attraction for free, but it’s actually relatively smart, as that will be the thing that pulls players into the game, and knowing that it’s there as much as they want it is going to pull pretty hard. It’s everything else, the little conveniences, that will get people to open their wallets. Operations (The Old Republic’s raids) will be off limits to free players, while the number of auctions free players can poston the Galactic Trade Network will be restricted. Subscribers will be the first to join the game in the event of server queues, too. It’s the smaller things that are really going to work away at the will to not pay, though, like having the freedom to travel by whatever method you want, which Free to Play players have ‘limited access’ to, or being restricted in what class and species you can choose to create characters with. This doesn’t seem like a half-baked emergency fix, but rather something that both EA and BioWare have given some thought to. Hopefully the move to free-to-play willdo a lot to help SWTOR grow.It’s a great license, and a great world, and even a great game, when the story starts to really shine through. What it needs is players to fill the servers. This has to work.